This Should work with Apple hardware as well as PC's. Wired Internet access on the machine with the wireless card on it, in my case i had a 10/100 LAN card that i was using as i couldn't get wireless to work which gave me full access to internet - although it is possible to put the files required on a CD and then add that CD as a repo in synaptic on the wireless machine, how to do this is not covered here, you could even extract the firmware on a different PC and place it in the right location on a remote PC using a CD/Pen drive taking a .deb of network manager with you. A CLEAN install of dapper or edgy, most of the problems/failures in the responses to this guide have been because of unclean installs giving configuration that gets in the way of this guide and stops it from working, my dapper was installed during the Flight 5 stage and updated from there to knot 2 so its not necessary to reinstall from 6.0* or even if it has been updated from breezy but you might want to think about reinstalling if you've messed around with Ndis prior to this. Okay so you have a wireless card that shows up in ubuntu but doesnt connect to any wireless network? The reason the card shows up but doesn't work is because ubuntu is only distributed with its driver (so it can recognize it) not with its firmware (so it can USE it) for legal reasons. However you can take the firmware out of the windows drivers and put them into ubuntu and make the card work! If that returns a string of numbers followed by the words Broadcom Corporation and then some more numbers then your in luck! But if not, try my guide anyway, it cant do any harm and it might work for you, its largely untested for cards other than mine and the success stories posted here so give it a go and see! 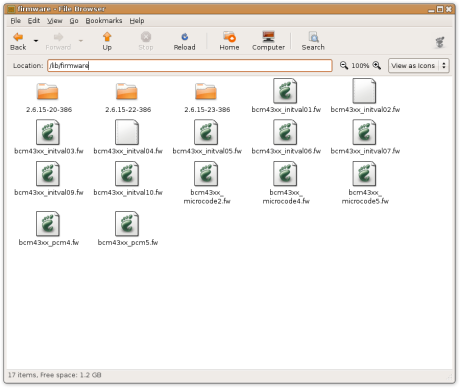 This will create lots of new files in the /lib/firmware directory, this is the firmware part of the driver that will make your card work with ubuntu! you may have to repeat this step each time the kernel is updated or you may not, your results may vary. 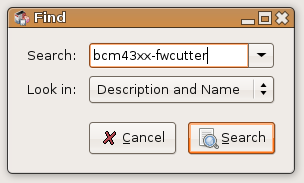 Note The location and name of the .o file for this command may differ in your case, if you really get stuck type bcm43xx-fwcutter and then hit space, find your file using the GUI and then drag and drop it into the terminal. From what i remember network manager should now show up by your clock and display your current connection, if your lucky it will show a series of bars, this means your now using your wireless connection so lucky you! and select the wirless network of your choice. as this is what the card is now set up to use, check if your router has a "mixed"
you could try renaming them to filename.zip and seeing if they open that way too. The command "bcm43xx-fwcutter /home/$USER/Desktop/bcmwl5.sys" creates the firmware files in the directory you are current in...it cannot be assumed that is the "Desktop". I couldn't figure out why it wasn't creating the files, then I stumbled across them in my "~" directory (where I ran the command). Not a huge thing, but I wouldn't consider myself too much of a linux newbie and it got me. Other than that...great work...I have wireless without the pain of the ndiswrapper manual install!!! Thanks a ton! out of interest what card is it? Last edited by nickm; May 31st, 2006 at 06:30 PM. Nice howto nickm, it deserves to be a sticky in my opinion. Last edited by nickm; June 1st, 2006 at 08:58 PM. Sorry, the input file is either wrong or not supported by fwcutter. Wow, thank you soo much. This was an excellent guide. I cannot express my gratitude enough for taking the time to make such a wonderful guide. I spent most of my day yesterday trying to setup my wireless on my laptop following the guides on the wiki. After messing around for quite some time, I finally got it to work. However, it wasn't even working all that great (I had to constantly config the wireless each time I rebooted via terminal). Then unfortunetly I had to reinstall my unbuntu (Dapper Drake btw) becuase of some problems I had trying to install KDE. Any how, I told myself I would reread over the wiki again today. To my unfortunate surprise, when I went to go look in the wiki today (search broadcom) all the guides that were there yesterday now redirect to a new guide that is terrible. I almost lost it. It was there one day, and gone the next (literally). I didn't know what to do. So I tryed my luck to search on the forums, and up came this thread, my life saver. Not only was this explanation much faster than anything else I've read, but it actually works completely for me. I love the new network manager that I didn't even know existed. Thank you for telling us about it, works much better than the default. I can just click and switch wireless connections easily. In my opinion, not only should this thread be made a sticky, but someone should add it to the unbuntu wiki. This will help many people and spread the word out on how to once and for all get these cards to work. Also I noticed this thread is under the Breezy section. I'm actually using the latest version of Dapper Drake (6.06 I believe) and I notice most users are having broadcom problems with Dapper. If it could be moved somewhere to a more general place, that would be very helpful for future users I'm sure. Last edited by Vaan; June 1st, 2006 at 07:56 PM. Thanks Vaan, i didnt even realise there was a dapper and breezy section, i have PMed a mod to rectify this, Thankyou! I will also incorporate your update into the instructions an another method of obtaining the driver files. Last edited by nickm; June 1st, 2006 at 08:59 PM.